The Lies About Truth is about Sadie Kingston. Sadie isn’t able to move on after she survived a car accident that killed her friend Trent. The novel was exceedingly well written and despite focusing on character development, was really fast paced. Sadie was an interesting and engaging character. She came alive on the page and was instantly relatable. The reader never had to guess at why she pulled away from her friends following the accident, or why she was having trouble adjusting post-accident. My favorite thing about this novel was watching how Sadie grew throughout the story. How she overcame tragedy and slowly put the pieces of her life back together. My second favorite thing about this noel was Max. It was his brother, Trent, who passed away in the accident. Max was so supportive of Sadie. He was just a good person. He did his grieving abroad and despite his loss he is positive. He really balanced out Sadie. What I truly appreciated about this contemporary novel was that each of the characters handled grief differently. Sadie pulled away from her boyfriend and best friend. Watching them try and build a friendship from the ashes was interesting and so true to life. Stevens does a great job of writing multifaceted characters. 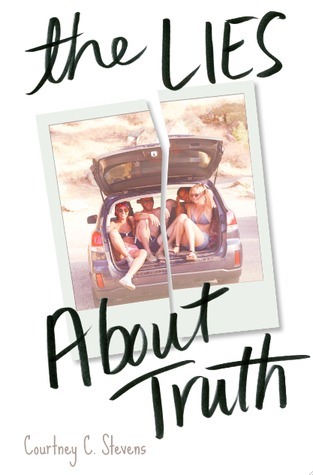 Overall, The Lies About Truth was an emotional but overall positive read. It isn’t about the car accident itself. It is about what happens afterward and how Sadie is able to move on after tragedy. This is a great beach read if you’re looking for something a little less light and fluffy but still want that quick moving, engaging, pace and plot. I've heard really good things about this book, but I don't think it's for me. Never have I really wanted to pick it up, but I just might on a whim one day. I'm glad to hear you liked it!